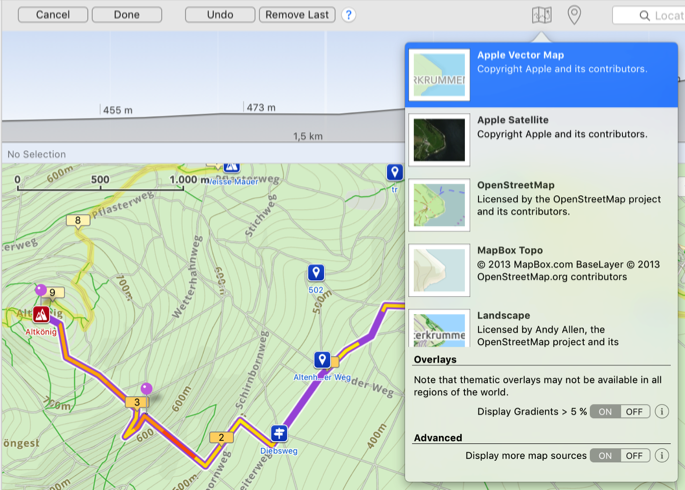 TrailRunner mini can display a color overlay that visually describes the gradient at a given route section. The color coding goes from yellow to red within the range of 5% gradient to 35% gradient. You can turn the gradient overlay on and off in the maps toolbar menu. Please note that there are some technical limitations on the accuracy of the gradient because the underlying elevation data is not very accurate at all times. TrailRunner mini therefore calculates the gradient within smoothed intervals. The white vertical lines represent split intervals. These depend on the distance of your recording and may be 500, 1000 or more meters each. 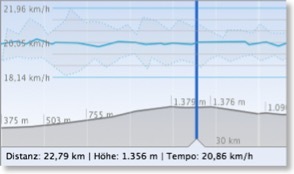 The blue horizontal line with the white circles displays your average speed within that split interval. The gray area around the blue line describes the lowest and highest speed ranges within a split interval. This means that your speed was always within the gray area whereas your average speed followed the blue line. When you select a spot, the lower information displays the absolute speed there, whereas the selection of a horizontal range displays the average within the selection. When you click into the graph, a measure scale overlay appears displaying a grid to compare speed values within the overall recording. What does ascent and descent stand for? Problem: In the altitude histogram, TrailRunner mini displays two values derived from altitude values. These are named ascent and descent. What's the meaning of these? Description: Ascent is the gain of only positive altitude differences. Descent is the opposite. How can I stwitch between kilometer and mile display? 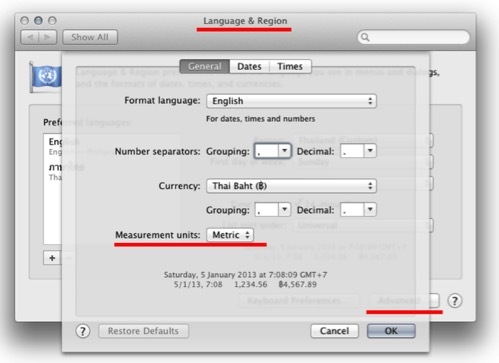 Problem: How can I set TrailRunner mini to display kilometers instead of miles? Problem: When TrailRunner mini downloads elevation data from the internet service, the elevation data looks inaccurate and does not match the GPS or odometer recordings of my GPS device. Or TrailRunner mini seems to remove elevation data from files I have imported. Description: TrailRunner mini downloads elevation data from a source that is based on the data provided by the NASA's Shuttle Radar Topography Mission (SRTM), which is a satellite scan of the earth surface. The resolution of the scan is about 30 meters (98 feet) in the more popular areas of the word and 90 meters elsewhere. What could happen now is that when your GPS device made a location recording that is not very accurate, the position may hit a spot where the actual altitude differs by a large amount to what the real position would describe. For example the false position recording may not describe the path you're on but the neighboring tree top, house roof or cliff top. This may lead to crazy point to point slopes of 30% and more. So TrailRunner mini filters out such implausible elevation data as good as it can. Otherwise all the cumulative ascend and descent data would be far of plausible values. This filter also takes place for imported files that need no elevation data download but also contain crazy point to point slopes. Please understand that the root cause to all this is the false GPS point recording in combination with a possible lack of resolution of SRTM data. TrailRunner mini can't guess what's right, but can easily remove what is obviously wrong.